After 200 speeches across eight days of debate, members of the House of Commons ignored the Prime Minister's final pleas to support her plan and threw it out by 432 votes to 202. The margin of defeat -- greater than the previous record set in 1924 -- means the Prime Minister now faces a deep political crisis with no clear way forward. The opposition Labour party immediately triggered a vote of no-confidence in May's government, hoping to capitalize on a perilous moment to force a general election. 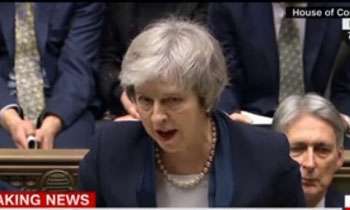 Acknowledging the scale of the defeat, the Prime Minister said she would allow time for the House of Commons to debate the motion on Wednesday. Labour leader Jeremy Corbyn called the defeat "catastrophic" and said a vote of no-confidence would allow the House of Commons to "give its verdict on the sheer incompetence of this government." People voted for Brexit but politicians are voting to remain. Wow, fine example of how should a parliament work.Here the boot licking MP s vote for the leader not for the policy. I am pretty certain you have never lived in Britain. Do you know Police are posted all over the British parliament to protect the MPs ? In a situation like this you can get the best advice from our MS.
Also from both sides regarding payments to MPs to influence voting.